PRWeek and Medical Marketing & Media have teamed up to produce a special batch of content that dives deep into the rapidly evolving health sector - including the inaugural Health Influencer 50. 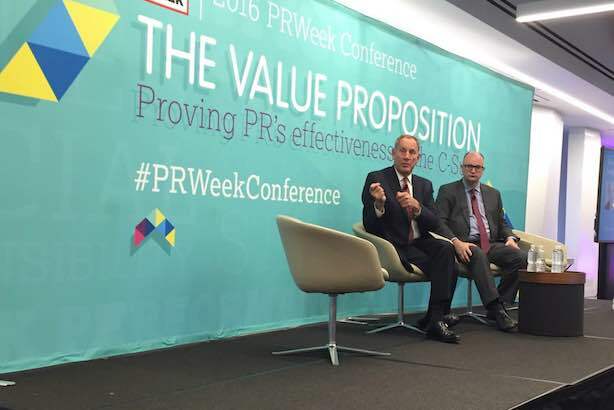 Cleveland Clinic's CEO Toby Cosgrove at the 2016 PRWeek Conference in New York. I recently had the pleasure of interviewing Cleveland Clinic CEO Toby Cosgrove at PRWeek’s annual conference in New York. Our discussion reminded me of the incredible change happening across the health sector — and the panoply of complex issues that need communicating and explaining. PRWeek’s first special Health Issue, brought to you in partnership with our sister title Medical Marketing & Media, analyzes those debates, with in-depth features on drug pricing, technological innovation, and health expectations of millennials; a profile of Ascension’s chief marcomms lead Nick Ragone; and interviews with Mayo Clinic’s CEO and Merck Consumer Health’s CMO. We debut our inaugural Health Influencer 50, highlighting the top movers and shakers in the health sector. We bring you case studies of cancer activations from Bayer and Novartis, plus reflections on Mylan’s EpiPen crisis response and GSK’s virtual reality migraine campaign in our new monthly Strategic Counsel and Health Matters sections. Strategic Counsel also introduces new columnist Lucas van Praag in a slot called Ask Lucas. Our third fresh element is New Influencer, profiling those who attract an engaged following on social platforms. Continuing the health theme, our first influencer is registered dietitian and nutritionist McKel Hill. All modern communicators know they can’t rest on their laurels or the profession will pass them by. Likewise, PRWeek continues to innovate and double down our laser focus to bring you the best content and resources to help you do your jobs better. I hope you like our new content elements.